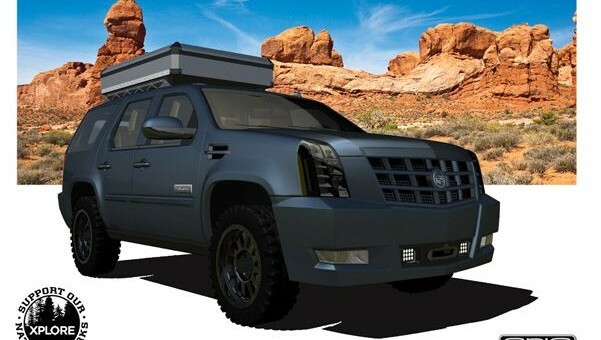 Want to turn your Cadillac Escalade into the ultimate glamour camping (“glamping”) off-road vehicle? Aria Coachworks will have you covered. For starters, Aria will outfit your Escalade with a custom suspension, BF Goodrich all-terrain tires wrapped around aluminum wheels, a Warn winch and aftermarket exhaust system. For those looking to ford some rivers, there’s a snorkel option. The XPLORE Escalade is also coated in a matte black paint, black chrome trim, power running boards as well as a roof rack. The inside of the XPLORE Escalade will feature new leather and suede seating, XPLORE all-weather floor and cargo mats, XPLORE/Filson luggage, and Woolrich car blankets. For those going all out, there’s no shortage of accessories, consisting of: an XPLORE Power roof-top tent, XPLORE aluminum gear and storage modules, bike racks, awnings, XPLORE Edition Camp trailer, a custom matching BMW GS Adventure motorcycle, custom Airstream Trailer, Old Town classic wooden canoes, Coleman Camping gear, and of course, XPLORE clothing.